Blue wings, knee-length robes and blonde hair are the characteristics of the heavenly Angels wearing Crowns. They get their name from the golden crown that adorns their head. Olly Wendt (née Sommer), the creative designer who worked alongside Grete Wendt, had already designed these graceful yet childlike and joyful group of figurines pre-1937. After almost 80 years, this 2,5 to 3 inches-high trio are finally returning to the collection in May. 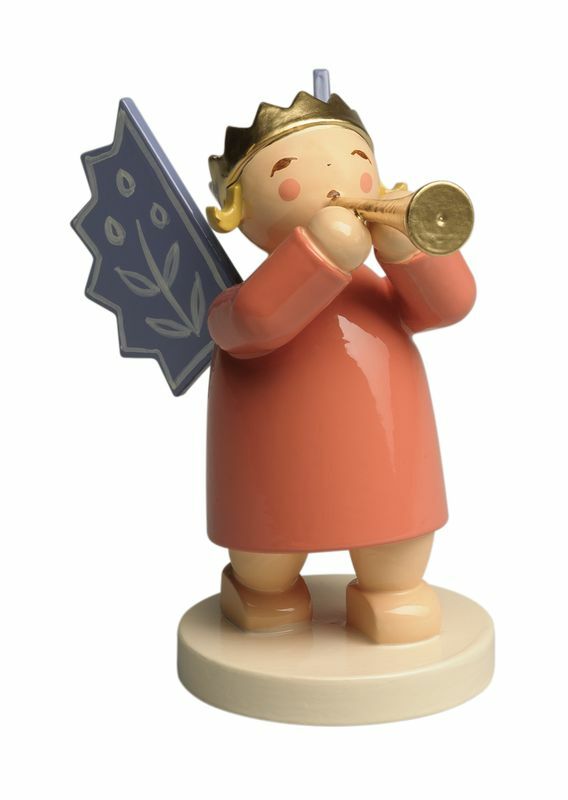 While the first Angel creates heavenly music with its small trumpet (this one), the second provides sustenance with a basket filled with juicy apples and delicious cookies. The third in the group has the best task of all – he carries a beautifully wrapped gift. And because the joy of anticipation is not only con-fined to Advent, we can already reveal that more Angels wearing Crowns will follow in the next few years. This one playing a small trumpet stands 2 inches tall. She can be pre-ordered now. She will be arriving from Germany in mid-May.